This week we are wrapping up a unit on entertainment, including music, that has a strong emphasis on expressing opinions. We also live in the heart of basketball country, with three teams within an hour of us that are participating in the NCAA tourney this week. As a result, basketball brackets are plentiful and predicting your team’s success is a hobby. Inspired by a similar activity in Teach Like a Pirate, we decided to create a bracket based on popular Spanish songs. Most are popular according to charts like Billboard; others are popular in our class. On our stations day yesterday, one of the stops was to pick up a bracket sheet and to use the iPads to listen to the songs. You can get a copy of the sheet here: Plain music bracket. Today we followed up by having students create their own questions and then having them chat about their preferences. Later in the week we will see what songs were the top vote getters, and then will probably do some activities with the winner. Are your kids excited about March Madness? 1. It helps me to keep my stuff together. At the beginning of the semester when I know nobody’s name, the attendance clipboard is a lifesaver. Add a Command Hook to hang it on and we are in business! 2. It’s a hall pass. My school actually uses clipboards as our hall passes, which means I don’t have to write them each time a student needs to go somewhere. This little gem is the most sought-after seat in our classroom. It’s in the front row, but with 90 minute classes, the prospect of seating in a chair that isn’t hard and plastic is enough to conquer their disdain for sitting up front. 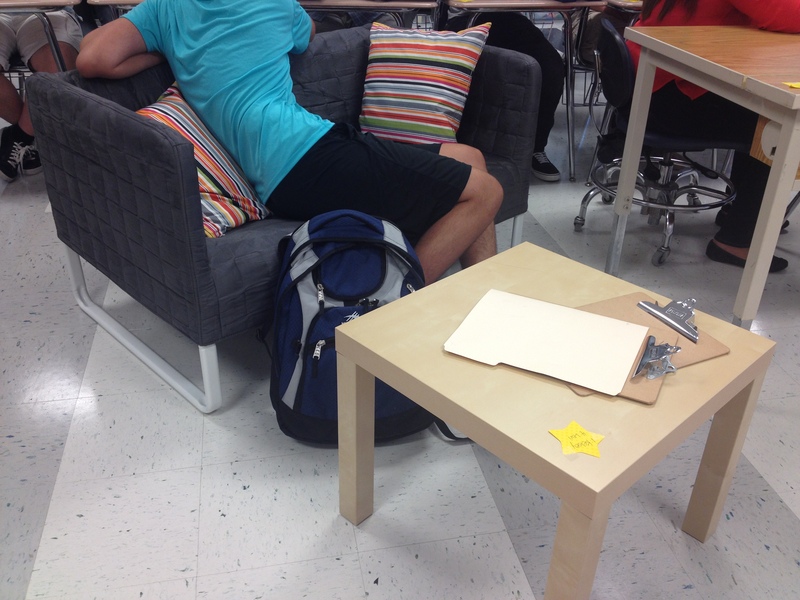 We have several “comfy” spots around the room, and encourage students to take advantage of them to improve their attention level and engagement–especially after three straight 90 minute classes. See the clipboards? What low tech, inexpensive tools have been surprisingly helpful in your classroom? Please share in the comments! 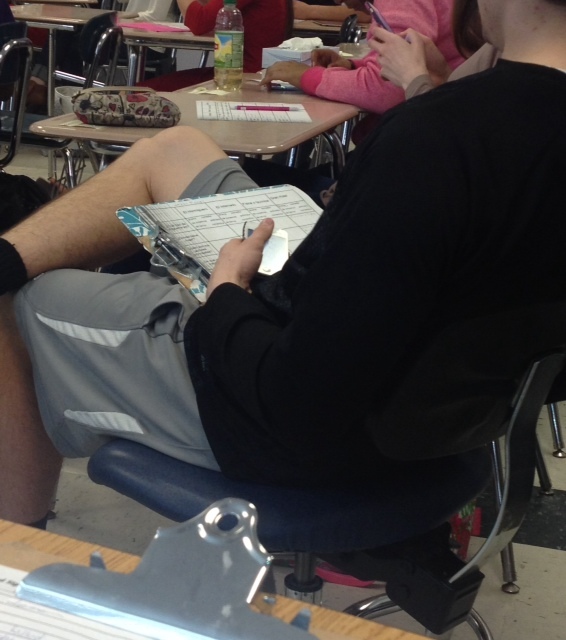 Yesterday I wrote about trying out a new tool for providing feedback to students about their written performance. Today we are applying the same concepts to a speaking performance, but also using another new tool: Flipgrid. Evaluating oral presentations has always been a logistical struggle for me. Though we have liberal access to iPads, we have had limited options for collecting video performances in one location, requiring that I check each iPad individually. We have tried one-on-one options, but that requires an independent assignment for the rest of the class–an option that sometimes works, but also sometimes…not so much. This is where Flipgrid comes ins another option. I am a first time, free trial, Flipgrid user, but so far, so good. Flipgrid allows you to pose questions for your students, who then see the questions and video record their responses. The responses are aggregated on one page for you to see, which helps streamline the assessment process. You begin by creating a “grid”. Each grid is a collection of questions. Since my intermediate students are independently reading novels, I want to check in with their progress from time to time. Martina Bex has a very good collection of questions that can be used with any story here; I’m using questions like them in my first grid called “story questions”. A grid could also be a class, a period, or any other group. 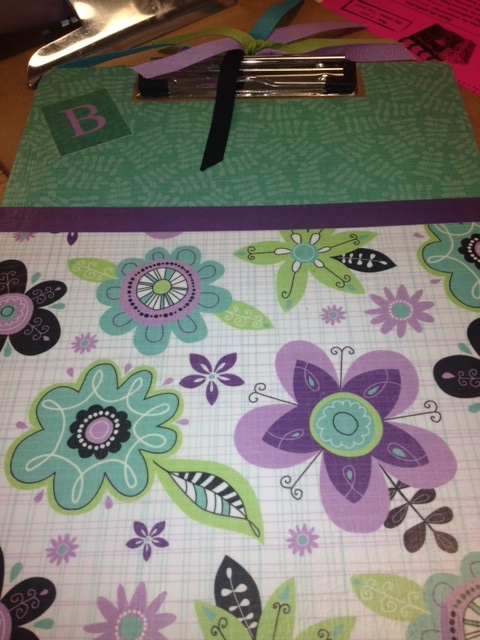 Think of it like a folder, and your questions (below) are your files. Each grid receives a unique URL that students use to find your questions. Next, you enter your questions. I opted for text questions, but I understand that there is a video option as well. The teacher controls which questions are available to students and when–another feature that I like because I can load up all the questions that I plan to use and then turn them off and on as needed. Questions appear on the same teacher page as the grid. You only need to scroll down to see them. To begin, students go to the URL that corresponds with the appropriate grid. They take a quick selfie for their profile, then see the question that you have prepared. When they are ready, they click the + button and a 3…2…1 countdown begins. They have 90 seconds to video record their responses. They have the option to edit their responses before finalizing. This is a quick process in all–about 5 minutes for the entire class to be done! Here’s my one question so far. As students complete their videos, my screen gets updated, looking like this (photos and last names blurred for privacy). Clicking on each student’s picture brings their video up on my screen. Then I can use a rubric like described in part one to provide feedback for students. Other features of the site are a variety of security options, but also some social networking options. I’ll need to work with those more before deciding how to proceed. The Flipgrid staff has been very quick and helpful with answering questions. There are tutorials built into the site to help teachers get up and running. One minor struggle: you must have the app installed on iPads in order to use them–you cannot use the site from the URL. However, this was quickly resolved and did not impede our overall experience. In summary, I have had a positive experience with Flipgrid, and will continue to explore it for potential use in my classroom. I like that it has a smooth interface that requires little advance preparation, and streamlines the process of viewing the videos. I love that it saves me class and preparation time, which hopefully will allow me to spend more time providing compassionate feedback to students. 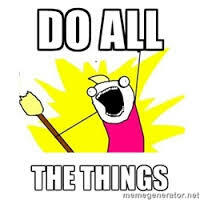 One of the many benefits of working with a student teacher this semester is that I am freed up from having to “do all the things” for my classes. As she continues to assume duties in the classroom and with students, I am freed up to work on some other projects and explore ideas that otherwise get pushed to the back burner. High on my list is trying to improve methods and tools to provide personalized feedback that helps students grow in their language skills. Our school has been working with the ideas in Carol Dweck’s book Mindset, and I’ve been thinking for a while about how I might incorporate those concepts into my classes. Several years ago, a wise colleague shared the origins of the word compassion with me: to suffer with. This thought has stuck with me because I’m a word nerd, but also because of the idea of “with”–that it is something that is done together. 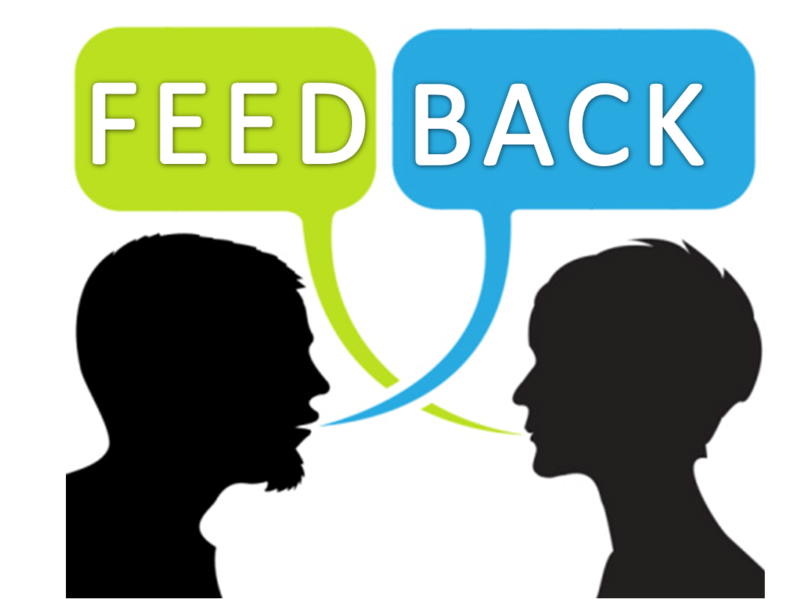 When applied to assessment and combined with my desire to work on changing student mindsets and increasing language skills, I cannot escape the idea that feedback is very, but VERY critical in this process. The feedback needs to be two-way, interactive, and personalized. Yet, practically speaking, it’s also very hard to provide effectively when you have large classes, many students, other duties, and a life away from school. And this is what I’ve tried to address with a feedback tool that I adapted this week. The catalyst for me was seeing an idea here. 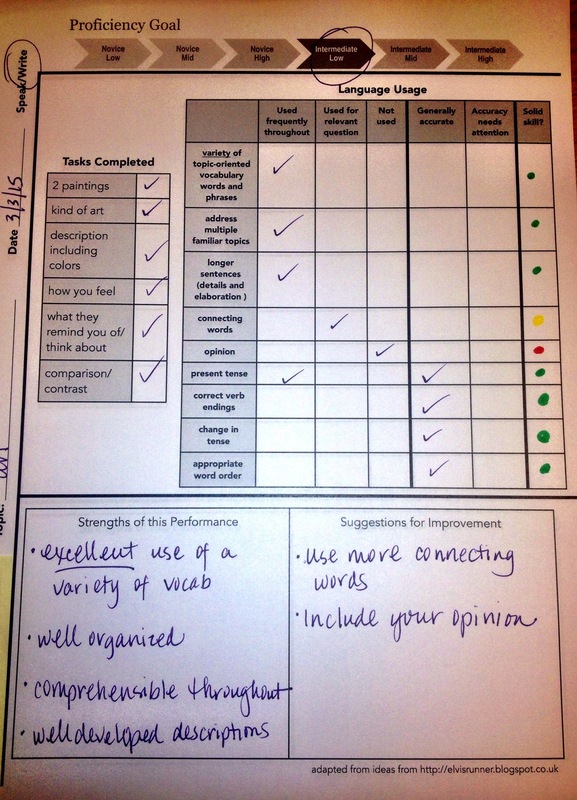 While in a different situation, the teacher had a desire to give more feedback to her students and developed a checklist style form to facilitate it. Inspired by that idea, I adapted her form to accompany my intermediate students’ most recent writing assignment comparing a couple of pieces of art. While we have a rubric that we use consistently to assess students’ work, I wanted something that would help us identify specific areas for students to address. I also wanted a way to help students appreciate the degree of their mastery of more specific concepts. So here’s what I’ve come up with as a working first draft. NEW on 3/6/15: Download samples of the documents here. Each of the elements of the form has a specific purpose tied to areas where students commonly struggle. In the small boxes on the left, there’s a list of elements that should be in the performance, based on the prompt. One area of concern has been that students simply don’t complete the whole prompt. I’ll check off the areas that they address in their writing. Across the top is a proficiency spectrum thanks to JCPS that has our proficiency target highlighted. I’ve circled this student’s performance level for this assignment so that she can compare her performance with our desired target. The large grid is for language usage. Here I’ve taken a mix of language from our rubric (variety of topic-oriented vocabulary words and phrases), lexical concepts (connecting words), and pertinent grammatical topics (changing verb tenses). For the vocabulary-oriented topics, I want to indicate an approximation of how consistently they are being employed in this piece–and check the appropriate box accordingly. For the grammar topics, I also add checks in the “generally accurate” or “accuracy needs attention” box as appropriate. While grammar is not our primary driving force, we are at the point where we need to draw attention to some of the novice-level errors that are still being made. I hope this will help students generate better questions about what they need, and help me understand what areas are still problematic for this student and this class. Finally, the last column is color coded to indicate their overall strength in that skill as supported by evidence in the essay. I’m using stoplight colors: green is “good to go”; yellow is “needs attention”; and a red is “let’s work on this one on one”. The boxes in the bottom third of the sheet are to allow space for comments. I’m completing this form for each student, and will have a mini-conference with each one after they’ve had time to review their feedback. I’ll also give them the opportunity to edit their work and incorporate the suggestions I’ve provided as a part of our growth model. I’ve found a few tweaks that I will make for the second edition of the form, and I know that the mini-conferences won’t always be possible. However, I’m hopeful that students will find this experience helpful, and that we will see the growth that we all desire. How about you? How do you collaborate with your students to provide feedback? What would make this process easier for you? Please share your ideas in the comments!